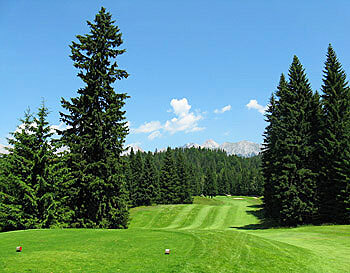 Seefeld-Wildmoos – the wild thing – is one of the most exhilarating golf courses in Europe. Seefeld is a famous Austrian ski resort, midway between Innsbruck and Garmisch and the course is perched some 4,000 feet above sea level in an area totally dominated by the backdrop of the Alpine peaks of Karwendel and Wettersteingebirges. The setting is dramatic. Seefeld opened for play to a fanfare of trumpets in 1970. This was the second 18-hole course in Austria to be designed by the late Don Harradine. The English architect's policy was to rely on Nature in order to create a unique course for its particular location and the course at Seefeld epitomises Harradine's design philosophy by slotting harmoniously into the gorgeous Alpine landscape. The high pastoral region of Wildmoos is surrounded by aged birch, larch and pine. It's a peaceful and immensely relaxing location, ideal for total concentration on the game at hand. It's no surprise that Seefeld is one of Austria's premier clubs. Four teeing areas, two for men and two for ladies, stretch the course from 4,613 metres to 5,960 meters. Seefeld is by no means long - especially since the ball travels further in the high altitude Alpine air. The challenge is not about length from the tee, it's all about position and keeping the ball in play on this tight tree-lined layout. Despite the altitude, the greens and fairways are in excellent condition. It's not surprising that the elevation changes are quite significant at Seefeld and there's a fair amount of climbing to be done. But the fairways are skilfully designed so that the height variation doesn’t cause too many problems, and, in any case, there are buggies available for those who need them. We think that the best way to see and play Seefeld is on foot, because every moment should be savoured. Just make sure you don't plan a trip to play here between November and April, because the course is covered in snow and used for cross-country skiing. Don’t forget your camera. The raised tees and low-lying greens with the mountains as the backcloth provide a delightful photogenic canvas. After your round, relax in the Tyrolean clubhouse and enjoy the mountain majesty. Seefeld is a special place and it will take your breath away. Seefeld-Wildmoos was Donald Harradine's favorite course and the 9th, a par 3 with a vertical drop of 60 meters, was his favorite hole. I'm not too sure about the latter selection, but in general there can be no denying that this is vintage Harradine stuff with a breathtaking profile and not a boring shot in sight. The mountain views are certainly great by reasonable standards and I'm sure that lowlanders will be sufficiently impressed. However, the site is pinched in a tight valley with an abundance of trees, so it's panoramically challenged in spots. If you love steep headwalls and rocky peaks all around you, while not even breaking a sweat, visit nearby Golfclub Achensee for unfettered beauty. Coming back to Harradine's pet project, it is a very different animal, when it comes to the golf. The constant up and down is intense, so the faint-hearted will probably take a cart and miss half the fun. When I drove onto the property for the first time and passed the 10th hole, I thought that this surely cannot be part of the course. Some kind of ski run in the winter, I assumed, but why did they mow it in the summer? But I assure you the climbing is very much worth it, because you'll get fantastically elevated tees and twisted fairways galore. Even though all of the greens are rather small and the bunkering is sparse, there are no two similar holes. The terrain obviously helps with variety and in this case makes sure that you don't get tired of the many short par 4s. The two par 5s and all of the par 3s are great as well.